Engine Design incorporates many parameters. Custom built not only for the car but also for the driver. Engine design is a crucial ingredient to any performance engine. This is the foundation that sets apart an average motor to a motor that performs at its peak. This important step in the engine building process is often overlooked. Any engine has to be designed to the application that it's intended for. Your generic so called crate motors can only get close in some instances to what the driver, (customer) and the vehicle require. We design engines specifically to both the parameters of the vehicle and to the driver so that the end product is exactly what is needed to bring about the desired performance. 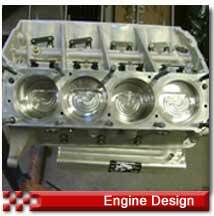 Camshaft and cylinder head selection are critical elements in designing a great motor. We use the latest computer technology to insure we get the right cam profile the first time, not the third time.